The Aesthetics of Urban Soil: Drawing with Dirt- open workshop in NYC! Urban soil is often ignored, under-appreciated and/or hidden from view. Let’s get to know ours! Part amateur soil science and part drawing workshop, this hybrid class will involve sorting, mapping and otherwise exploring soil samples from various urban locations. We’ll send samples through a sieve to reveal their constituent parts, and then when we’ve purified them a bit, we’ll use them as a drawing medium. Come prepared to get your hands dirty! Note: It will be greatly appreciated if each person brings a soil sample. This does not require anything fancy! A clean yogurt container and a sturdy spoon are all the equipment required. Dig down about and inch below the surface, then take your sample from the next 3-4 inches of soil, digging it up and transferring it to your container until you have about a pint. Don’t try to edit or sort your sample- twigs, rocks, bottle caps, it’s all part of our urban soil! Ellie Irons is an artist and art educator with an interest in ecological systems and citizen science. Last summer, she started the project “Urban Soil Appreciation Initiative”, which involved soil sampling and sorting in Philadelphia’s Wissahickon Valley Park. Her course at Trade School is a continuation of that project. Trade School is an open forum where people barter for an education. They are still accepting classes. Instructors set the terms of their payment from students. hi, this looks cool…and thanks for sharing an image of my work. I thought you might like to know that I have an installation in NYC right now at the Museum of Arts and Design, and it’s squarely about the aesthetics of urban soil. 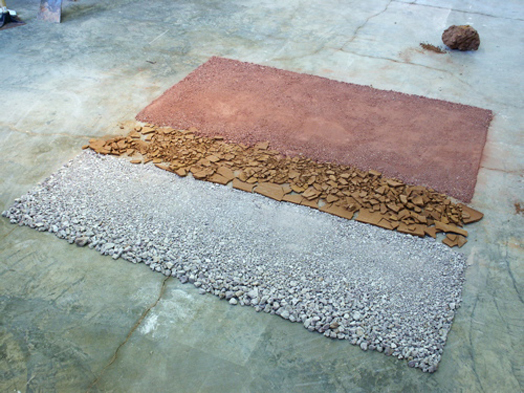 I worked with Dr. Richard K. Shaw of the Natural Resources Conservation Service to create an installation using soils from his recently completed New York City Reconnaissance Soil Survey, a 15 year, 5 borough project of urban soil mapping. The whole show at MAD may be of interest to you…. http://margaretboozer.com/exhibitions.html. Swept Away: Dust, Ashes and Dirt in Contemporary Arts and Design. Up through August 12. Panel discussion with curator, artists and scientists June 9. Thanks for letting us know! We will go check it out.